Volvo XC90, Jeep Wrangler, Audi TT… Some vehicles enjoy a longevity far beyond the normal automotive industry replacement cycle. So it is with the fifth-generation Toyota 4Runner, which made its debut in 2009. Some might regard C$46k/US$44k or more as expensive for a 10-year-old, body-on-frame, mid-size SUV, but sales of new 4Runners in both the US and Canada increased in 2018, even if Toyota sells many more unibody Highlanders. And 4Runners continue to hold their value better than some newer SUV offerings – at the time of writing, a two-year-old SR5 was for sale near us in Calgary for C$40k – if indeed you can find a good second-hand one to buy. If you’re more of a Toyota Land Cruiser type, check out this equally stealthy, limited-edition 2020 Land Cruiser Heritage Edition. In Canada, a single 4Runner model is available, with which buyers can specify one of five different feature packs. For 2019, Toyota has introduced a C$8,960 Nightshade 7-Passenger pack, one up from the Limited, which combines cabin upgrades and stealthy black exterior mods with some major chassis changes: X-REAS sport suspension, full-time 4WD and 20in black alloy wheels. Total price is C$55,115. In the US, the 4Runner Limited Nightshade Edition is one below the top of a seven-model range. It’s available with rear-wheel drive, starting at US$44,965, or with full-time 4WD from US$47,000. Both US Nightshades only offer seating for five. We spent a week with a Nightshade 7-Passenger 4Runner to see whether the old-timer can still show tech-savvy younger rivals a thing or two. 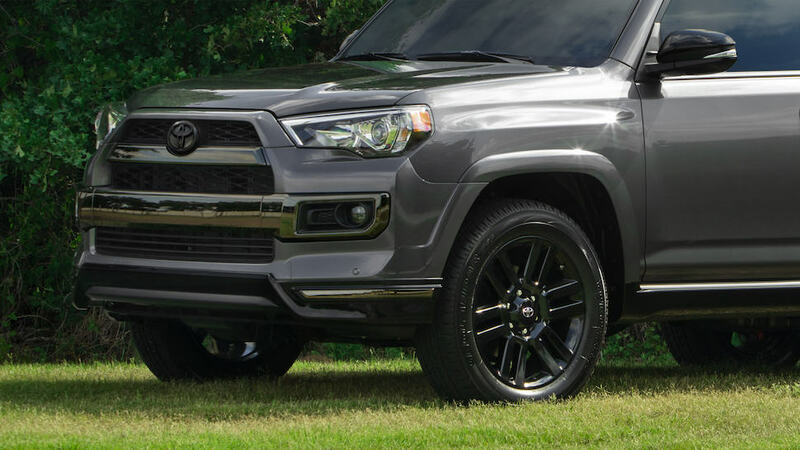 Fans of the 4Runner TRD Pro should check out our trending review here. As we’ve noted before, mainstream SUVs are looking increasingly alike. Strip the badges off a Toyota Highlander, Nissan Rogue and Subaru Ascent, and you’ll be hard pushed to tell differentiate between them. That’s not a problem that affects the 4Runner, however, whose chunky, retro-influenced styling still stands out – and has succeeded in keeping it looking fresher than newer rivals. The bluff profile won’t do the aerodynamics, and therefore the fuel economy, any favours, but more on that later. Specific to this Nightshade edition is an awful lot of black trim. Top of the list are the black rims and midnight black metallic paint, but there is also a black chrome grille and fog lamp cover, black mirrors, door handles and lower rocker panel, plus black accents on the front and rear bumpers. The running boards retract for a cleaner profile and the splash guards are removed entirely. The overall effect is understatedly stylish, in a sinister kind of way. We liked it. The Nightshade’s interior is a long way from the rough-and-ready cloth seats and easy-clean interior trim of the early 4Runners. There’s black leather on the comfortable, electrically adjustable seats (with memory function on the driver’s side) to match the mud-collecting black carpet and black dash trim. The dashboard feels about as modern as decade-old truck is going to get. The small, monochrome screen in the instrument cluster has some old-school pixilation but there’s also a 6.1in colour touchscreen on the center stack to handle audio and navigation functions. As part of the Nightshade package, the audio is upgraded to a 15-speaker-plus-subwoofer JBL setup. Many of the other controls feel like they’re from a few years ago, which can be good or bad. Toyota’s ubiquitous exterior mirror switches are ageless, for example, and the column stalks are satisfyingly chunky, but the dials to control front-seat heating and ventilation are very small, very low-set and fiddly. Kids take note: there are no rear-seat warmers. Lateral space and headroom for passengers are both good in the first two rows, and there isn’t the same sense of sitting ‘on the vehicle’ that you get in the domestic body-on-frame SUVs. The 4Runner’s cavernous trunk has long been a major draw for outdoor types who want to haul a lot of stuff and the popular sliding rear cargo deck can make loading easier. That’s not an option in 7-seat configuration, however, and unfortunately, the two third-row seats, while offering additional practicality in occasional use, compromise the load space for the rest of the time. The floor is no longer flat, and the load height is not only raised for most of the available area, but steps up away from the lip, making it harder to load all but the smallest items. The 4Runner Nightshade is powered by a 4-litre, 270bhp, normally aspirated V6, driving all four wheels through a conventional 5-speed automatic transmission. There’s no fancy 10-speed auto, CVT or small-capacity turbo engine here. It’s a terrific, proven powertrain and suits the 4Runner’s character perfectly. The motor is smooth, quiet and torquey (278 lb-ft), stepping up when necessary but providing decidedly un-trucklike levels of refinement the rest of the time. Considering its age and truck-like construction, the 4Runner drives pretty well on the road. The wide range of seat and steering-wheel adjustment makes it easy to get comfortable. Forward and rear visibility is fine, but the B-pillar obliterates the side view when checking your blind spot. The X-REAS interconnected dampers on the Nightshade are designed to improve on-road handling without compromising performance off-road. Wheel size increases from 17in to 20in, shod in this case with Yokohama Geolandar A/T P245/60 tires. The results aren’t bad. There’s still plenty of cushioning sidewall around those big rims so smaller, secondary inputs are well suppressed and there’s no harshness whatsoever transmitted to the cabin. One might argue that there are fewer modern electronic systems to go wrong after the three-year warranty expires and the V6/5-speed combo has proven reliability, although a simpler suspension system than X-REAS might be more durable over the long term. Where the 4Runner struggles to cope is with loping, primary inputs that send into pitching fits from which it takes a few seconds to recover. You wouldn’t get that kind of lazy body control from Ascent & co. In the models with full-time 4WD, there’s proper off-road ability from a driveline that offers a Torsen lockable, limited-slip centre differential. We can’t claim to have taken the Toyota rock-crawling, but we did spend a lot of time on snow and slush during a weekend of winter camping. On those surfaces the 4Runner was nothing but confidence-inspiring, as well as being easy to place on narrow forest roads. It’d be easy to dismiss the 4Runner as a bit of a dinosaur. Very little about it screams ‘cutting edge’: it has cruise control, but you’ll have to look elsewhere for the latest driver-assistance systems, for example. There’s no auto start-stop, nor mild-hybrid trickery. Even full-size trucks like the 2019 Ram 1500 are plusher and better equipped. Customers appreciate the 4Runner’s practicality, versatility and rugged simplicity. Loyal owners dote on their 4Runners with all manner of customizations. One might argue that there are fewer modern electronic systems to go wrong after the three-year warranty expires and the V6/5-speed combo has proven reliability, although a simpler suspension system than X-REAS might be more durable over the long term. And when our real-world fuel economy of 12.7L/100km over 495km of use matched that of one of the new breed of sophisticated, supposedly more frugal SUVs, all the while delivered by a powertrain that has character and refinement in equal measure, then it’s even harder to cast the 4Runner as out-of-touch. Vehicle assessment is an objective business, but buying decisions are often subjective. Objectively, the 4Runner falls short of what the latest SUVs can offer in everyday, on-road use. But subjectively, it has the personality to put a smile on your face when you see it on the driveway or get behind the wheel. That’s as valid a judgement as any favourable spec sheet or performance comparison, and another reason why it continues to find buyers.